I can’t believe it’s almost Monday already. I don’t get a long holiday weekend but I sure wish I did. The last two weeks at work have been a bit crazy so I feel like I’ve been so behind on everything. I was able to catch up on a bit of organizing in my studio and even went to the gym this weekend. Woo-hoo! Our Little Secret by Darren O’Sullivan. A thriller that starts with a man and a woman at a deserted train station. Both are waiting but before you know it, the woman is stopping a suicide. Sounds intense already doesn’t it? 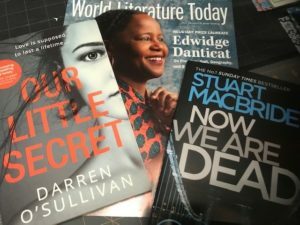 Now We Are Dead by Stuart MacBride – This one features DCI Roberta Steel who’s recently been demoted. Jack Wallace is the man she needs to bring back to justice before he attacks more women. Then there was also the latest World Literature Today. I love this magazine but I still have a few editions from last year that I need to read and every time I read this I end up adding countless books to my TBR list. Granted a good thing but just makes me wish for more free time to read. I also went to the library this weekend and I’ll tell you about what I found there in my next post. What I didn’t find was a Mary Oliver poetry book. I looked at our online catalog and noticed that most editions were checked out. What else? Oh and I still need to tell you about my mystery book group meeting last week which was a lot of fun as the author stopped by to meet with our group. Anyway, I hope you all have a great week ahead and more book talk soon! Sounds like you had a good weekend, Iliana, though it was a bit colder than I liked (and that wind Saturday – brrrr!). I’ll be interested in hearing about your mystery group and the author visit. How fun! I’ll hopefully have something sort of like that to share about our February meeting (if it all goes well). Hope your week goes well. Take care and stay warm! A cold and windy weekend here, too. Can’t really imagine what it must be like in the areas where the temps dip below freezing all the time. I’m not surprised that Mary Oliver’s books are all checked out. Her death made me want to read more of her poems again, too. Hi lady, enjoy your books and your magazine. Cool that the author stopped by your mystery book group meeting too. Happy week! Magazines, there are several that I love but I am perpetually behind on them. Thankfully I borrow digital versions from my public library so I don’t have to look at the paper versions piling up all over the house. It’s so hard to balance magazines and books! I am not the least bit surprised that all of Mary Oliver’s books are checked out. I don’t own any and plan to borrow a bunch for National Poetry Month in April. Hopefully, there will be several for me to choose from by then. Our Little Secret has me interested. I hope that this week is slower for you and you can get a little caught up. Kay – I know right? It was beautiful outside and at first thought it would be good for a walk but oh boy that wind was chilly. Can’t wait to hear about which author makes it to your book group! By the way, have you heard of the Lampasas Literary Festival? I need to investigate that! Jen – I cannot imagine living somewhere you have to dig out from the snow! Then again, come summer I wish we were living up north. Ha. Yes, I wasn’t surprised to see Mary Oliver’s books all check out. I need to add some of her books to my private collection so I need to see what I can find at the bookstore. Bookworm – I hope you are keeping warm over there! It was a treat to have the author stop by our book group meeting. She was so personable and it was fun to hear about her series. Stefanie – So true about finding that balance between magazines and books. We have quite a few subscriptions at our house and are always months behind in reading them. Unfortunately I still can’t get used to reading them on an iPad. Maybe I just need to try a bit more! Les in OR – That’s a great idea to save them for National Poetry Month! Hopefully you’ll be able to find some then. I did put one on hold so hopefully it’s ready to pick up soon. Vasilly – It sounds good doesn’t it? Well, this week which I thought was going to be on the quiet side has been anything but. Oh well, at least it’s hump day! And, can I just say again, how happy I am to see you back to blogging! Melody – I like the sound of it too! I hope it’ll be a good one. Enjoy your week too, Melody! Isabel – Thank you for sharing the link girl. Hope you are doing much better!